But what to do when there are so many lights to head for? 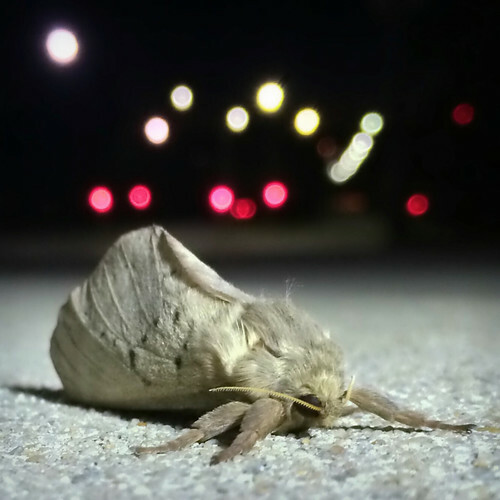 This moth was resting up after what must have been a big Saturday night out on the town! The lights in the background are traffic and street lights on Kings Avenue near the intersection with State Circle. iPhone 5s - Photographs taken with the camera on an iPhone 5s. Camera - The native Camera app was used with the HDR option. Filterstorm - Whitebalance correction applied. Photogene - Chroma and Luminence noise reduction filtering applied. Photoshop Touch - Image cropped to square format then re-sized to 2448 x 2448 pixels. Filterstorm - Sharpening filter applied. Pixlr Express Plus - "Soft" black vignette added. ExifEditor - EXIF data from one of the original photographs transferred to the final image.